The Intermec LabelShop has been discontinued. No direct replacement is available. Intermec LabelShop is the ideal barcode label software to meet your needs. The user-friendly interface combines powerful Windows based commands with the graphic flexibility to scale, rotate and mirror graphics. 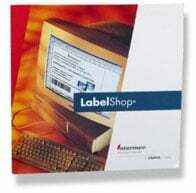 LabelShop guides you through designing and printing labels in-house quickly and easily. Users can display multiple labels, drag and drop or cut and paste objects between labels. Objects can also be linked to other applications using OLE objects like Clip Art and spread sheet data. Intermec LabelShop uses Intermec printers for maximum speed and high quality labels with barcodes, text and graphics. Intermec's family of LabelShop software offers a suite of choices whether the customer is a small business or a large company running their printers via the network. LabelShop can be used for label design in any application and provides excellent management tools.